When I first read the title of this book, although a substantial sized publication, I did think that this was an ambitious aim for one publication. In the introduction Ingledew clarifies that the book is about ‘opening doors’ and possibilities for the reader and a tool to assist them ‘connect to numerous sources that will inspire them.’ After an initial reading, the book is likely to be used more as a compendium of stimuli and sources of reference that can be dipped into by the reader. It takes the stance that to be a successful creative individual you need to be ‘multitalented, multi-skilled and totally multidisciplinary in outlook.’ The book offers definitions of what communication, inspiration and imagination can be and offers the reader a series of questions, theories and viewpoints on ‘what are ideas’ and ‘who are ideas people'. The introduction finishes with a section defining a 16-stage strategy for solving a creative brief, taking the reader from the start to the completion of this task. This offers those new to the process of executing creative briefs a handy primer and reminder of what needs to be considered such as understanding of your audience, the importance of play and visualizing and revisualizing your ideas. From page 26 to the end of the publication (page 211) the book is divided into an A-Z, rather than chapters, with the included entries selected by the author for ‘their dominance in creativity’ - each of the entries introduces either a source for ‘inspiration’ or ‘potential ideas’. Some letters are dedicated to one entry whilst others cover a range of categories. Under ‘A’ 'Art’ is given a small entry only showing a few examples of how well-known historical paintings have been ‘reinterpreted’ by more contemporary artists and designers. Artists are, however, referenced throughout the rest of the publication with examples of their ‘play’ and innovative ways of looking and translating what is familiar. Each letter of the alphabet has an entry – those less commonly used to start words ‘concentrate more on the ‘individual’s’ understanding and manipulation of ideas and imagery such as ‘J’ – ‘Juxtaposition’, ‘K’ - ‘Knowledge’, ‘Y’ – ‘You’, ‘Z’ – ‘Zeitgeist’, whilst other more commonly used letters combine process and manipulation of ideas with suggested sources to look at for inspiration. ‘I’, for example, includes the headings ‘Icons’, ‘Illusion’ and ‘Irony’; ‘T’ includes ‘Tension between words and images,’ ‘Torn Images’, ‘Travel’ and ‘Type’. The whole alphabet section is filled with an abundance of full colour images that richly illustrate the points made by the minimal but succinct use of text. The images are sourced from both historic and contemporary culture and span a broad, if sometimes predictable (to a more experienced practitioner), range of visual media. This book, which is easily navigated throughout, allows the reader a quick and clear ‘taster’ of what each section covers. Throughout these lettered sections there are a series of quotes from artists and designers that add further weight and support to that section’s discussion. The book is a rich source of initial inspiration giving a series of punchy sources to look at or consider when developing a brief and concept. The sections also have ‘DIY’ sections in the page margins, which either comment on further aspects to consider on a topic or suggest further tasks that could be undertaken by the reader. This book would be a useful reference for teachers to direct students to as a starting point to a brief, or as a welcome addition to any new design student’s library. It contains a comprehensive wealth of examples and suggestions of sources to access which will be both familiar and unfamiliar to the reader but will hopefully stimulate and act as a trigger to a broader, less predictable way of thinking. 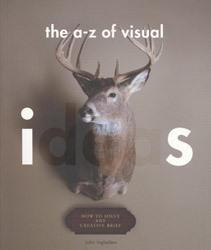 The book successfully reminds the reader that the most common and familiar objects/images/scenarios can be developed and be perceived, through creative thought and process, as a new and original idea. A great source of visual reference! Dr Bernadette Blair is Director of Academic Development for studio–based learning and teaching in the Faculty of Art, Design & Architecture at Kingston University.